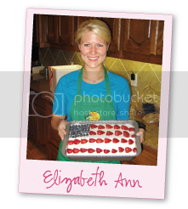 Elizabeth Ann's Recipe Box: A Winner and National Donate Life Month! I love that you posted about this. As you know, my sister Lauren is a heart transplant nurse and gets to see first hand the relief, hope, and excitement on these patients' faces as they receive word that they will be getting a new heart... without it they would die. What a blessing to give someone on your way out of this world. I will be visiting donatelife.net today to make it official. Thank you for sharing this! I have to admit that I am quite ignorant of these facts -- thank you for this information!